The capital, Lefkada Town, sitting at the northern tip of the island is a textbook Greek town built on a natural harbour. First established by the Venetians, this traditional yet cosmopolitan town is laid-back, peaceful and serene. Tread the maze of narrow alleys lined with colourful buildings, a true delight to explore on foot. As you stroll around the town you’ll discover architecture, dating back to the 17th and 18th Century, of impressive steeples and exquisite temples. As the sun goes down behind the mountains the town comes alive, with traditional tavernas, stylish cocktail bars and dreamy ice cream parlours! Along with unspoilt beaches Lefkada offers an array of attractions including historic sites, monasteries and natural beauties. The mountainous terrain is ideal for all sorts of outdoor activities and after all there’s no better way to explore the island than along the network of green trails and through unspoiled landscapes on foot. Head to the mountains of Elati – enjoy the breath-taking views, serenity and the eye-opening nature. A real treat for nature lovers - enjoy a stroll or a bike ride through the immortal olive trees of the Venetian olive grove, dating back to the 17th Century. Or take a horse ride through the unspoilt countryside to enjoy the rare flora, springs, streams, dilapidated ruins and abandoned monasteries. If you’re lucky you may still spot a local with their donkey loaded with baskets of kindling along the way! The Dimosari waterfall near Nidri is a must see during your holiday. Follow a shady path under the planes until you reach this stunning waterfall with its dense vegetation and picturesque lake. Plunge into the crystal-clear refreshing water falling with great force from the mountain heights above – you’ll feel like you’re in the jungle! If you are a culture lover a visit to Agia Mavra Castle, located north of Lefkada Town is a must. Built in the 14th Century to protect the island against enemy attacks, it is a superb example of fortressing architecture and it has undergone extensive renovation over the years. The fortress was built amphitheatrically on the cliffs of the north-eastern side of the island. During the summer the castle hosts a variety of cultural events. 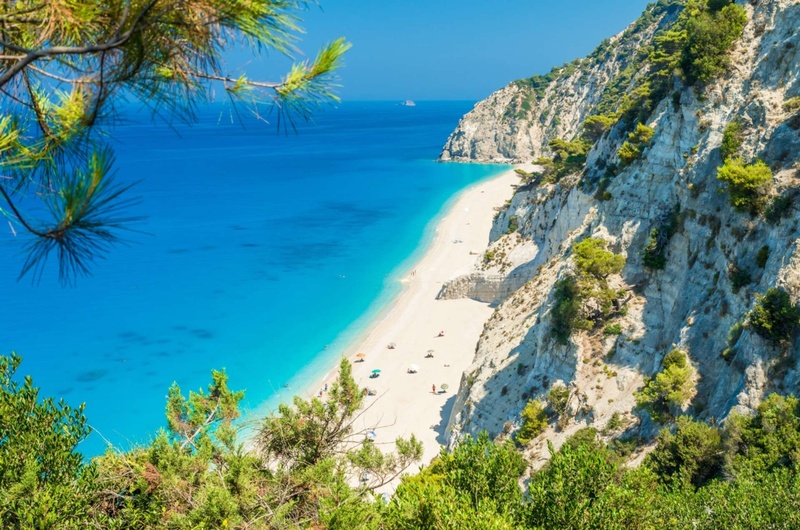 Finally, one of the most interesting sights is the Cape of Lefkada in the southern part of the island – locals say Lefkada takes its name from the white chalk cliffs of the south – Lefko meaning white. Legend has it that the poetess Sappho threw herself over the sheer cliffs into the raging sea at the Cape because of her love for Phaon. Here once stood a temple to the ancient god Apollo; in its place, a lighthouse has been built from the ruins of the temple. Lefkada is renowned for its award-winning beaches scattered around the island. Vast idyllic fine white sand, sheltered bays of smooth white pebbles, crystal clear turquoise water, majestic cliffs that swoop into the sea, backed by tall pine trees emitting that unforgettable natural pine fragrance that lasts in your senses long after you leave the island. For a soul-cleaning swim head to one of the many blue-flag beaches - Pefkoulia, Egremni, Agiofili, Kathisma and Milos are just a few of the best. Not forgetting Porto Katsiki, described by many as ‘a slice of paradise’. Experience a breath-taking sunset on the beach of Egremni and make memories that last forever. Lefkada is full of gastronomic surprises! Enticing fish tavernas across the island serve exquisite fresh fish and seafood dishes. Many village and harbour tavernas offer mezedes or meze, small plates of food served with ouzo. Why not try an authentic local dish like bakaliaros skordalia (battered salted cod with traditional Greek potato and garlic dip) or bourdeto (fish cooked in tomato sauce with onion, garlic and spicy red pepper). Taste the local fish recipe mpourdeto - a typical dish of the Ionian Islands. The flavoursome local lentils of Englouvi are a must - cooked with garlic and oregano to a thick creamy consistency. Head to a waterfront taverna and try a glass of one of the Siflogo wines, produced locally since 1994, Siflogo is Greek for blazing passions! Somada is a local soft drink made from barley or almond and orange-flower – typically locals will enjoy this refreshment on their Sunday afternoon stroll. Karidopita (walnut cake with syrup), Pasteli (honey candy) with almonds and mandolato (nougat) with honey and almonds are to be enjoyed by those with a sweet tooth! Take home a jar of the local delectable thyme-infused honey from one of the many roadside vendors throughout the island. 6th August celebrates Agios Donatos Lentil festival. The extremely rare and delicious Englouvi lentils are cooked in large cauldrons by the village women at the plateau above the village. In the evening after the church service, everybody gets together in the church square where the locals from Englouvi offer bowls of the tasty lentil soup, sardines and free flowing wine – the party continues into the night with Greek music and traditional dancing. Something a little different to experience is the enactment of a village wedding in Karya held on the evening of the first Sunday in August. Karya is a sleepy traditional village, known for its stone houses and centred on the local kafenio, where you’ll discover traditional embroidery made by women of the village who continue to dress in the regional costume. On this special day, the village comes alive, overflowing with locals enjoying live music and traditional Greek dancing, in hope of preserving old customs and local traditions. Various religious feasts and cultural events are held throughout the year on Lefkada. One of the most significant being the international Folklore festival, held around the last week of August – the main venue is in Lefkada where you’ll find parades of dancers performing cheerfully, dressed in their traditional costumes, holding their flags and singing songs from around the world. Island hop to Meganisi, Kefalonia or Ithaca by ferry. Cruise around the island in a private water taxi or take a boat trip from Nidri to peek at the private island of Skorpios, once owned by the billionaire Aristotle Onassis. Liz Taylor, Winston Churchill, dukes, aristocrats and of course, Jackie O are just a few of the many to have joined in the famous parties and celebrations on Skorpios. Lefkada enjoys characteristic Mediterranean climate, bright sunshine, blue skies and seldom cloudiness. The prevailing winds make for a welcoming cool breeze. Summer temperatures begin in May and continue through until October - the hottest months being July and August when temperatures can reach 40°C. The superb weather conditions make Lefkada a top destination for sailing and yachting. The katabatic wind blowing in the early afternoon makes Vasiliki a dream location for windsurfers, kite surfers, catamaran and dingy sailing, whilst underwater divers will be amazed in the deep azure waters among reefs rich in marine life. Lefkada (or Lefkas), the fourth largest of the Ionian islands is connected to the mainland by a long causeway and floating bridge. Drepanos, a narrow canal, just 50 metres wide separates Lefkada from the mainland. The Town of Lefkada is only about 20 minutes from the Aktion Airport. As Lefkada does not have its own airport flights arrive to Aktion National Airport also known as Preveza airport. There is a good choice of direct flights from UK airports including Gatwick, Manchester, and Birmingham. Discover the sleepy seaside village of Sivota in the southern eastern corner of the island. By far one of the most picturesque harbours on the island, Sivota is perfectly located in a pretty sheltered bay where the sea looks like a lake, surrounded by wooded hills, olive groves and backed by verdant mountains. The picturesque fishing harbour offers some of the island’s most renowned fish tavernas serving delicious fresh fish, seafood and tasty lobster. 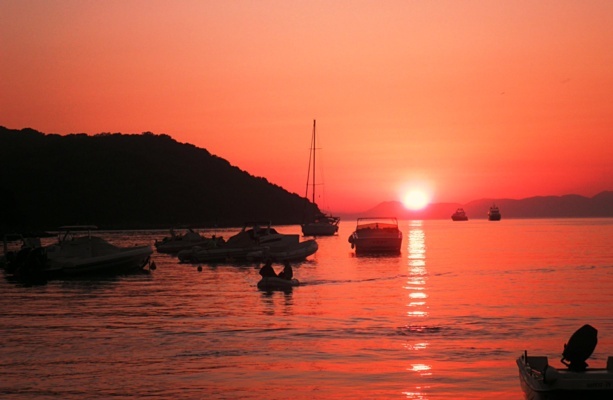 Well known for its yachting community, Sivota resembles a peaceful little village by day but as the sun goes down the waterfront comes alive with a bustling atmosphere. Lygia, 6km south of Lefkada town, is a wonderful base for family holidays. Originally a fishing village, the picturesque harbour offers traditional fish tavernas where you can savour the fresh catch of the day. 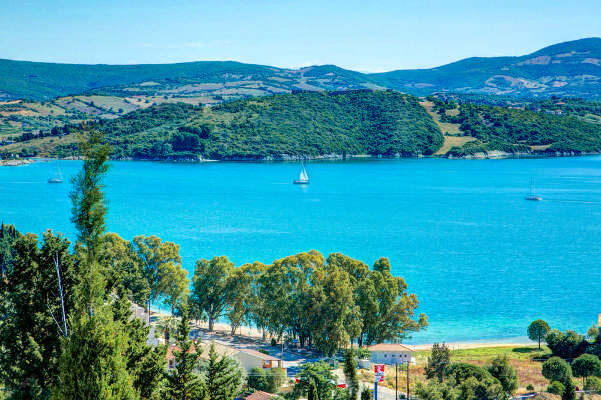 Take a walk in the hills around Lygia and enjoy its natural beauty perfectly framed by pine trees and olive groves, then head to its charming pebble beach with calm clear waters for a relaxing dip.